The Hippologia is an impressive clock & automaton that took over 4,000 hours to craft. 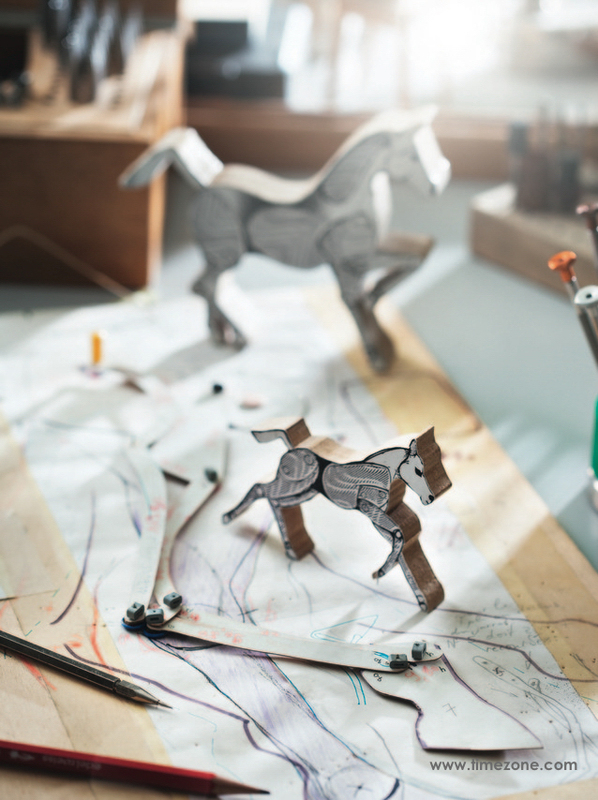 The two clockwork figures perfectly simulate the running movements of horses as they rotate on top of the clock base. Absolutely phenomenal work by Michel Parmigiani of Parmigiani Fleurier. 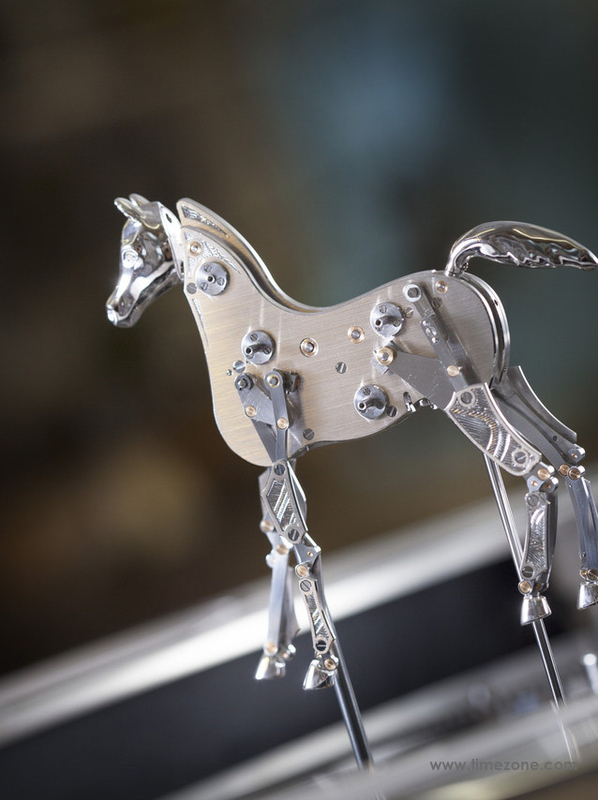 Inspired by the Maurice-Yves Sandoz Collection, the automaton takes the form of the Arabian thoroughbred. Crafted in solid gold statues, a mare runs with her foal inside an oval crystal cabinet representing the desert and its dunes. The crystal glass is crafted by Lalique. 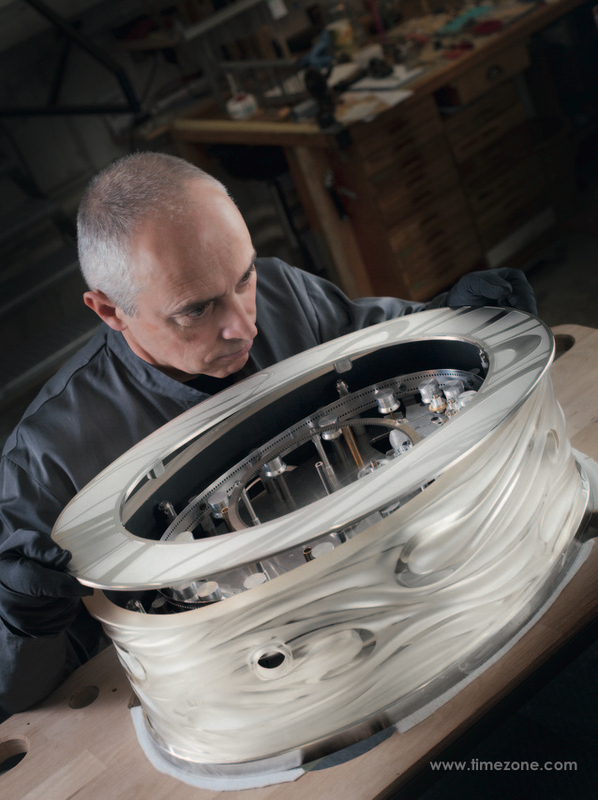 This clock features no less than 2,200 components. Its base houses two mechanisms side by side, one connected to the automaton, the other to the time display. The system which triggers the automaton almost constitutes a third mechanism in itself. It was a year in the making. The window set with white and champagne diamonds shows the hours and minutes over three hours, as well as the scale which can be used to adjust the operation of the automata to the desired time. 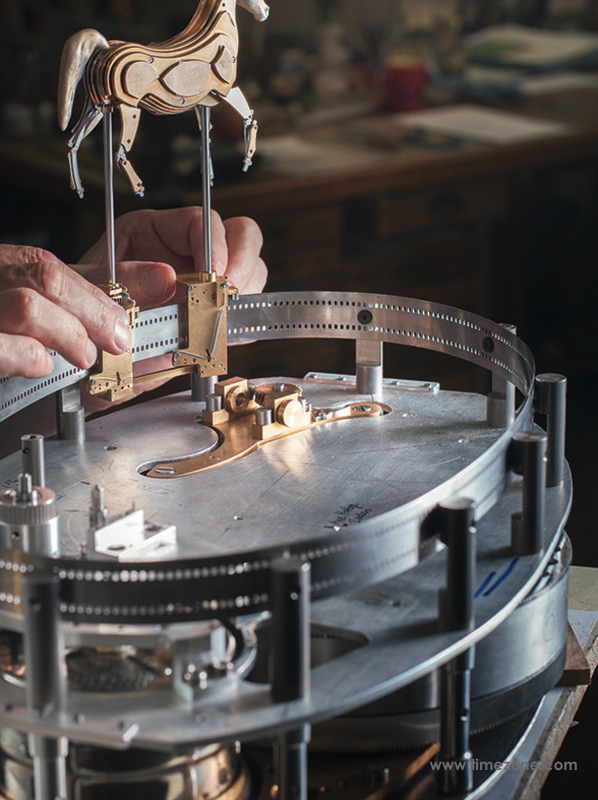 The mare and her foal are designed as a clock movement showcasing historical watchmaking expertise. The head, tail and hooves are cast in silver and hand-polished by a jeweller. The horses' bodies feature a hand-engraved decoration, while the finishes on the table clock mechanism are finished to the highest level of classical haute horlogerie. Circular-grained main plate, Côtes de Genève decoration and eloxided, hand-bevelled bridges. Mirrored glass with gold lustre by LALIQUE, unique piece with "Dunes" pattern. Cabinet with nickel-palladium finish, satin-finished, sand-blasted and polished by hand. Adjusting arm with nickel-palladium finish, satin-finished and polished by hand, extra-white mother-of-pearl cabochons. Silver window with nickel-palladium finish, engraved, satin-finished, and polished by hand. Setting: 268 VVS1 9 ct white diamonds and 4 C6 VVS1 1.41 ct champagne diamonds. Back engraved with "Lalique/Pièce Unique/Parmigiani Fleurier" and Individual Number Hours/minutes drum: anthracite lacquered with 4N gilded appliqués. Anthracite lacquered display drums with 4N gilded appliqués. 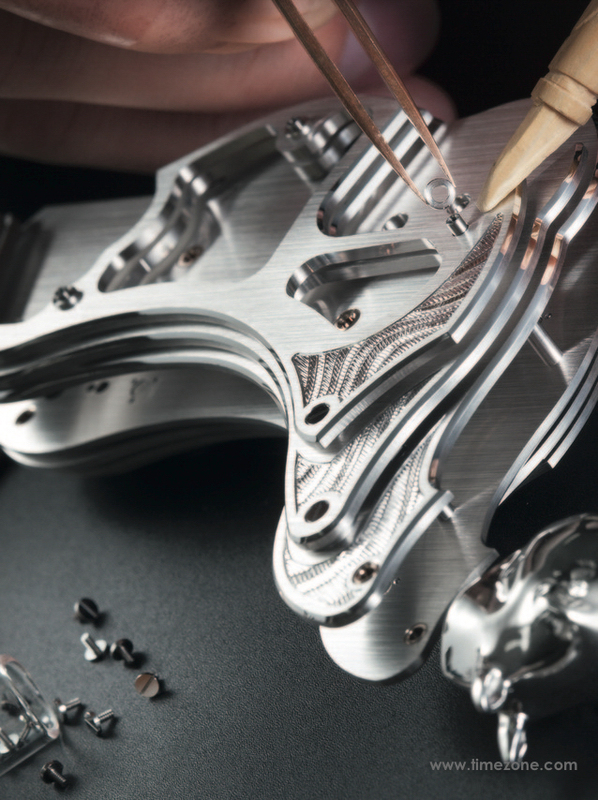 Covers with nickel-palladium finish, satin-finished and polished by hand. Mare and Foal plates in 18 ct white gold with rhodium-plated finishing work, bevelled, satin- finished, and engraved by hand. 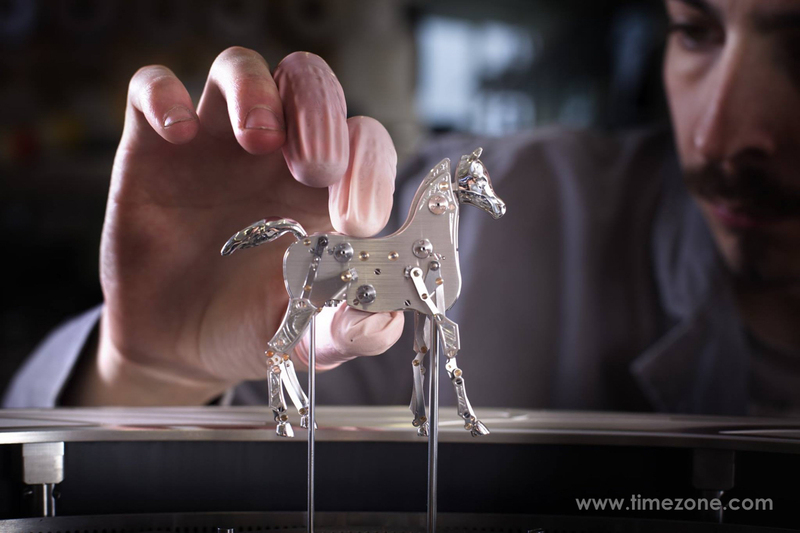 Heads, tails and hooves of Mare and Foal in silver, with rhodium-plated finishing work, polished and finished by hand. Eyes set with VVS1, 0.02 ct white diamonds.